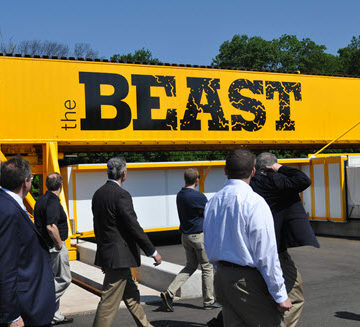 The winners in the ASCE Innovation Contest Innovative Business Models category visited the BEAST at Rutgers University. It shouldn’t be surprising, as it was hardly coincidence. Still, it was remarkable to see how in lockstep the winners of the ASCE Innovation Contest were with each other and with their hosts, Pennoni Associates, at events in Philadelphia and at Rutgers University in New Jersey. “It’s been a great opportunity for networking and learning,” said Mahmoud Halfawy, Ph.D., M.ASCE, whose software for optimal bridge preservation planning won the contest category’s Most Feasible Award. The 2016 Innovation Contest is a first for ASCE, part of the Society’s Grand Challenge strategic initiative to seek ways to reduce infrastructure life-cycle costs. 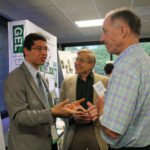 The contest was divided into four categories, with winners in each honored at separate events where they presented their ideas to industry leaders. The Pennoni-hosted event brought together three winners and one honorable mention in the Innovative Business Models and Technologies category. 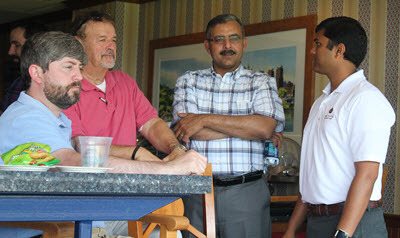 From left, Jeff Hay of RDI, Nelson Shaffer of Pennoni, Mahmoud Halfawy of IDS, and Annoj Kothari of American Cast Iron Pipe, talk during the Innovation Contest event visit to a Philadelphia Phillies game in the Pennoni box. Each approached different problems within the project cycle with different innovative solutions, each fitting well with one another. Entering with the support of the Los Angeles Section’s Sustainability Committee, Mark Capron, P.E., M.ASCE, received honorable mention for his “Incentive for Performance” idea, focused purely on the business side of getting innovative projects funded and started. Halfawy, president of Infrastructure Data Solutions in Regina, Saskatchewan, Canada, presented his Most Feasible Award-winning NBI Optimizer® software that is capable of generating optimal system-level long-term bridge preservation plans. “Infrastructure managers face a daunting challenge of allocating scarce resources among thousands of assets with competing needs of rehabilitation and replacement options. Current methods can only generate sub-optimal plans, which may lead to diverting much-needed resources to wrong projects” Halfawy said. 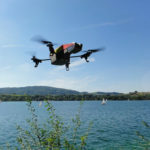 With two winners providing innovations in business incentives and enhanced life-cycle planning, the other two winners offered examples of creative projects that could build on top of those foundations. The group tours the BEAST, with the traffic simulator ready to roll overhead. Best Value Award-winner Maury Gaston of American Cast Iron Pipe in Birmingham, AL, explained his proposal for an “Expanded Water Network” that would transport large quantities of water from flood regions into areas of need using a widespread network of pipes. 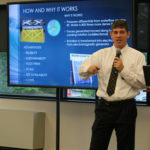 The Most Innovative Award winner RDI Technologies, based in Knoxville, TN, showed off BridgeView, a low-cost, non-contact camera infrastructure monitor that measures frequency wave forms to detect flaws in pumps, bridges, and other structures. 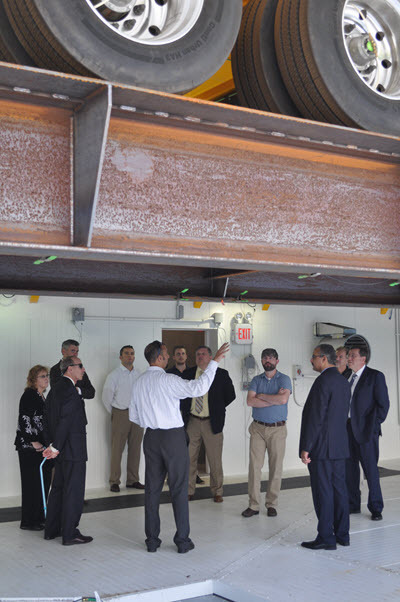 The group of winners enjoyed being in their element at Rutgers University’s Center for Advanced Infrastructure and Transportation, a state-of-the-art facility that has helped develop the bridge tools known as RABIT for deck assessments and the THMPER, which assesses and fixes flaws. A demo of the BEAST (Bridge Evaluation and Accelerated Structure Testing) showed how this large chamber subjects bridge materials to the wear and tear of 25 years in only nine months. The work at Rutgers’ center particularly spoke to RDI founder and CEO Jeff Hay, Ph.D., whose work involves bridge assessment technology: “They’re doing things that we are very interested in doing in terms of taking real data on bridges, trying to model the deterioration, and looking at dynamic issues with bridges. This event for contest winners followed the Green Engineering event in May. 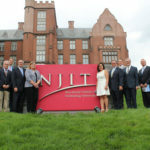 The remaining two categories’ events, on resilience and the Internet of Things, are scheduled for mid-July at New Jersey Institute of Technology and at Walt Disney Imagineering in California.